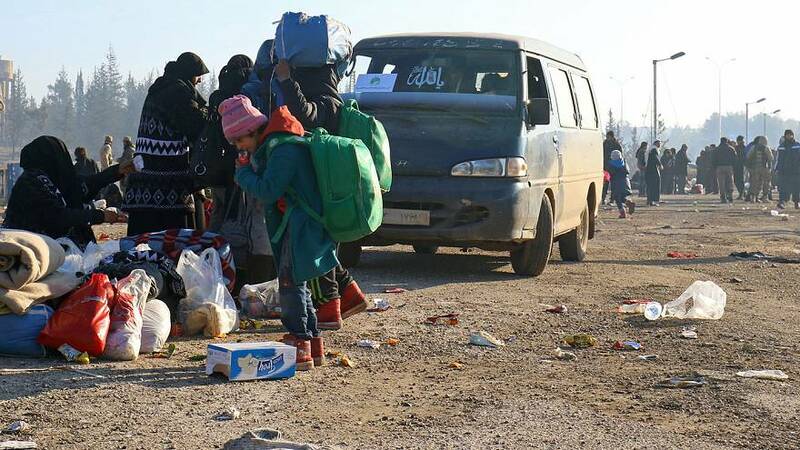 The evacuation of civilians from areas of northwestern Syria which have been besieged by both government and rebels has been continuing on Monday morning. Buses carrying Shi’ite Muslims reportedly left two villages surrounded by insurgents – part of a deal enabling the Syrian army and its allies to allow people trapped in Aleppo to leave. Earlier, there was joy and relief as people were driven out of the last rebel-held zone in Syria’s largest city. The UK-based monitoring group the Syrian Observatory for Human Rights said that 4,500 people had left eastern Aleppo since Sunday. A United Nations official said on Monday that 50 buses and two ambulances had left the rebel zone. Those who have now arrived in parts of the countryside held by the insurgents are said to include Bana Alabed, the seven-year-old who has been tweeting with the help of her mother about conditions in Aleppo. Buses carrying around 500 evacuees from east Aleppo arrived late on Sunday in rebel-held al-Rashideen, where aid workers rushed to distribute food supplies and winter clothes to the new arrivals. Many people have been waiting to leave since a ceasefire and evacuation deal was agreed last Tuesday. There have been several hold-ups and thousands still remain inside the city. The evacuation of two Shi’ite Muslim villages long besieged by rebels saw ten buses carry people to a government-held area of Aleppo – according to Syrian state TV and the UK-based Syrian Observatory for Human Rights. Foua and Kefraya, north of Idlib, have been besieged by rebels for years. The evacuation of civilians, including wounded people, is a condition for the Syrian army and its allies to allow thousands of fighters and civilians trapped in Aleppo to depart. First limited evacuations, finally, tonight from East Aleppo and Foua & Kefraya. Many thousands more are waiting to be evacuated soon. Several buses on their way to the villages were attacked and burned on Sunday. Both sides blamed each other. Syrian state media said “armed terrorists” – its term for insurgents fighting President Assad’s rule – were responsible. Rebel officials said the attack was carried out by an angry crowd of people, possibly pro-government forces. Getting people out of the villages has been fraught with difficulty and has held up the whole evacuation process in and around Aleppo. The chaos surrounding the exodus reflects the complexity of Syria’s civil war, with an array of groups and foreign interests involved on all sides. The United Nations agreed on Sunday on a compromise draft resolution on UN officials monitoring the evacuations from Aleppo. The Security Council will meet to vote on the text on Monday morning in New York.